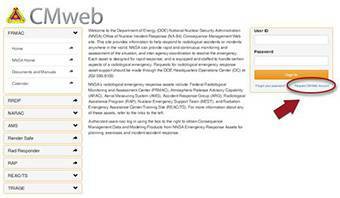 The CMweb is an internet-based, data dissemination application used to assist federal, state, tribal, and local decision-making during a radiological incident. The web-based system provides a convenient method of sharing consequence management information, such as event status, plume model, and deposition predictions, measurement data, and protective action recommendations. Authorization to the information is controlled by the Coordinating Agency through the FRMAC Director via CMweb administrators. There are a limited number of accounts available on the CMweb. Authorization for an account is provided on an individual basis, with further restrictions on accessible information based on need-to-know. External personnel are typically granted access for a specific event (i.e., drill, exercise, real-world incident) and once support to the event has ended, the account is terminated. To request a CMweb account, please click on the link below, then select “Request CMweb Account” under the login fields in the grey box on the right.